A Brazilian émigré of Polish origin, architect-designer Jorge Zalszupin (born 1922) is revered for his role in pioneering the Brazilian Modern aesthetic in the midcentury. 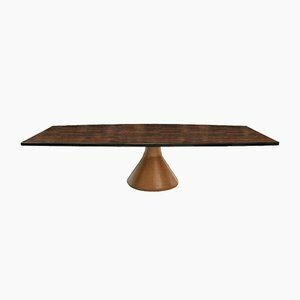 Heavily influenced by the refined minimalism of Danish modernists like Hans Wegner and Arne Jacobsen, Zalszupin’s work oeuvre is characterized by graceful lines, classic detailing, and impeccable woodwork utilizing local sources like Brazilian jacaranda (rosewood) and imbuia (walnut). 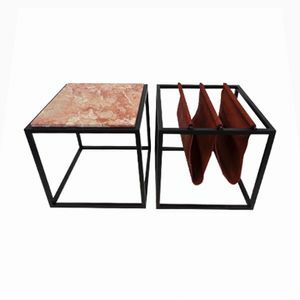 Rather like his contemporary Jean Gillon, a Romanian-born designer who made his name in Brazil, Zalszupin embarked upon his furniture career only after he emigrated at the end of World War II. Zalszupin arrived in Brazil in 1949, a paradigm-shifting time for Brazilian urban development, as iconic names like Oscar Niemeyer, Le Corbusier, and Lucio Costa were shaping the Brazilian entry into the realm of modernist architecture. 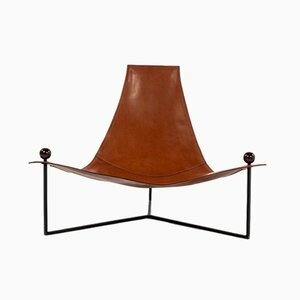 While Zalszupin produced alongside a variety of talents across his career, it was with Niemeyer that Zalsupin most saliently collaborated on furniture design. 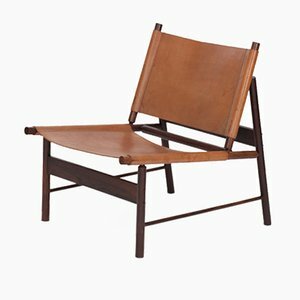 Through the 1950s and 1960s, Zalszupin provided bespoke pieces, such as his Brasiliana Armchair (ca. 1965), for several of Niemeyer’s buildings in Brasília, the newly-built federal capital qua modernist utopia located atop the Brazilian highlands. Before his Brasília output, however, Zalszupin had already gotten his feet wet in producing modernist design for the Brazilian market. 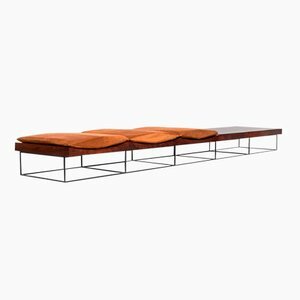 In 1959, he founded L’Atelier, a collective studio comprised of architects, engineers, craftsmen, and a full-scale team of professionals, whose work helped to define the burgeoning Brazilian modernist movement. 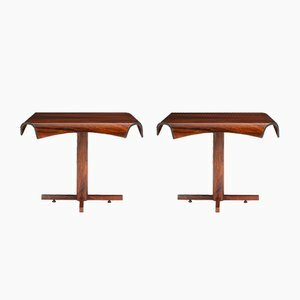 Their catalog, which chiefly used Brazilian woods and chromed metal to create sensual and elegant shapes, appealed for its blend of the Danish ergonomic form with the expressiveness of Brazilian material. Particularly emblematic was L’Atelier’s flagship Dinamarquesa (“Danish,” in Portuguese) design, an immaculate armchair with distinctively curved armrests, crafted with imbuia wood and cowhide in 1959. L’Atelier, while most prolific in the 1960s, continued to produce into the latter 20th century; the Percival Lafer-designed Imboya Wood Armchairs, for instance, were developed at some point in the 1970s. 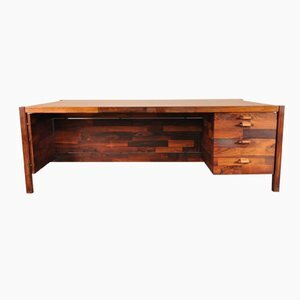 While Zalszupin is no longer active in design, much of his work has seen recent dissemination through the designer Etel Carmona, who has re-edited some of his designs for the contemporary market with more sustainable materials (jacaranda, a key Zalszupin wood, has been an endangered species since 1991). 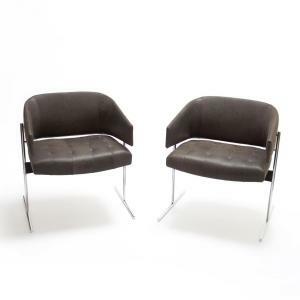 The new collection—which include twenty pieces Zalszupin designed in the 1960s, like the PO 801 Armchair (ca. early 1960s), Circa Bench (ca. 1966), and the Petalas Side Table (ca. 1962)—had their first US launch in 2014 through the New York design gallery and shop Espasso.